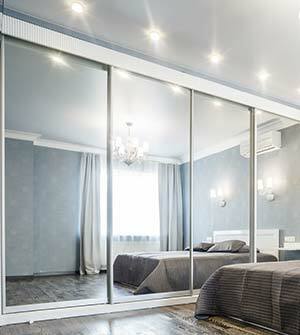 Made to measure pivot mirror doors to fit your space perfectly. Finger pull handle incorporated into frame for easy opening. All pivot sockets and slides pre – fitted for convenience. resistance and colour fastness over the life of the product. resistance according to ISO 3270. Visible frame width (from the front) 34mm. Bottom Rollers are manufactured from galvanised structural steel. High-strength plastic wheel with embedded sealed ball bearing race. Weight loading up to 60kg / pair with 50,000 opening / closing cycles. Twin wheel top guide is constructed from structural steel. fixed to an elastic moving arm which follows the track precisely.